Believe it or not, for the last several years Apple has been using Microsoft Windows-powered handhelds to process purchases at its chain of Apple Stores. That changed this last holiday season when Apple replaced the Motorola/Symbol handhelds with iPod touches running a point-of-sale app and sheathed in a specially manufactured case that include a barcode scanner, a magnetic stripe reader, an extra battery, and a stylus. The system, which Apple calls EasyPay, allows any Apple store employee to act as a cashier. 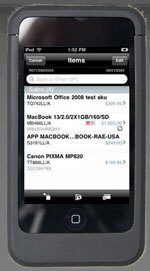 A product’s barcode can be scanned, the customer's credit card can be swiped, and signature captured on the touch screen of the iPod using a special stylus from Pogo. If a customer wants to pay with cash, the employee can press a button on the POS app to open one of the several cash drawers installed around the store. For Apple, nothing is more important than the user experience, and in retail stores that directly translates to their high-touch approach to customer service. By utilizing a mobile point-of-sale system, the same employee can demo a product, answer a customer’s question, and process the sales transaction right there on the spot. Even product returns can be processed from the EasyPay system by scanning the barcode on the receipt, by searching for a product's serial number, by looking for the customer’s e-mail address, or by entering a credit card number. All this eliminates lines and improves customer experience. Is Apple targeting the rugged/enterprise device market? The release of iPhone OS 3.0 made it possible for developers to better integrate accessories with the iPhone and iPod touch. It was only a matter of time before Apple's mobile devices started making inroads in the rugged device space. Microsoft holds a virtual monopoly in that niche, with Windows Mobile and Windows CE handhelds accounting for almost 100 percent of the market share. However, Apple's use of the iPod touch for POS interactions successfully demonstrates the enterprise potential of the touch and iPhone. Will Apple bring their custom-manufactured EasyPay sleeve to market? If not, will another third-party manufacturer will lead the way? Apple has a lot of work to do if it wants to take a significant share in the rugged device market, but the potential is certainly there. If you are aware of any other enterprise case studies showing the iPhone or iPod touch replacing Windows-powered rugged devices, please let me know. I may cover them in a future article. Point-of-Sale purchases at Apple Stores are now accomplished with an iPod touch equipped with a barcode scanner and magnetic stripe reader.